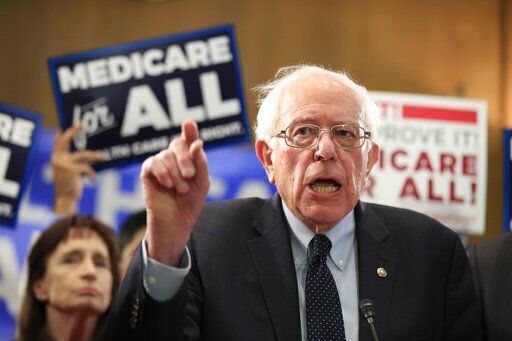 By Jon Greenberg on Thursday, April 11th, 2019 at 11:54 a.m.
Medicare for All is both a rallying cry for some Democratic voters and a lightning rod for conservative attacks. When Vermont Sen. Bernie Sanders rolled out his latest version April 10, it became a moment when other Senate Democrats running for president could decide to sign on or take a pass. When fully implemented, Medicare for All would replace private insurance, as well as Medicaid and Medicare. The Affordable Care Act — former President Barack Obama’s signature health care accomplishment — would go away. A government-run health insurance program would replace them all. During the first four years, people could choose to stay on their current insurance plan, buy into Medicare, or buy a new public option plan. The veterans health system would stay in place, as would Indian Health Services. The new Medicare for All bill largely mirrors an earlier one, but this version fully covers long-term care, an expensive addition. Our guide to Medicare for All answers many questions about the program, but one of the biggest unresolved issues is how it would be paid for. The bill offers no new details. Sanders has said before that it would drive down health care spending, but outside estimates put the rise in federal spending in the $25 trillion to $32 trillion range over a span of 10 years. Because it lacks broad support in Congress, Medicare for All is more a roadmap than a viable piece of legislation. But it plays a key role in the health care debate in the Democratic primary. Most of the Senate Democrats running for president had backed an earlier bill, and the question was, would they commit again? The four who had backed it before stuck with the bill. Sens. Cory Booker (New Jersey), Kirsten Gillibrand (New York), Kamala Harris (California) and Elizabeth Warren (Massachusetts) signed on as co-sponsors. The lone hold-out in the Senate was Minnesota’s Amy Klobuchar, who has never endorsed the plan. But co-sponsoring Medicare for All was no bar to backing other Democratic proposals to expand health coverage. There are bills to allow people to buy into Medicaid, to buy into Medicare at age 50, and to offer everyone a public option health plan. The most obvious take-away is Sanders stands out for backing his plan, and no other. As far as co-sponsorship goes, Harris has the most inclusive approach, signing on to all four. Harris spokesman Chris Harris (no relation) explained that all the bills support the principle that health care is a right, not a privilege. "Medicare for All is her preferred approach, but she will also continue to vocally support other common sense measures that increase coverage and bring down costs for Americans," he said. Warren’s office echoed that theme, and underscored that the transition plan in Sanders’ bill contains elements of the other measures. "She’s already on record supporting the Medicare buy-in and public option policies that are included in Medicare for All legislation and would provide coverage options during the transition to Medicare for All," Warren spokeswoman Ashley Woolheater said. Warren’s all-of-the-above approach comes through in a video she tweeted for the rollout. Even as she praised Medicare for All, she said, "We will not back down in our protection of the Affordable Care Act. We will defend it at every turn." Booker cast the bill in a similar light. The morning of Sanders’s event, Booker was on a New York radio station saying anyone running for president who backs Medicare for All has to immediately answer the next question. "In a split Congress, what are you going to actually do in your first year to make health care more accessible and affordable?" Booker said. Booker pointed to the buy-in options, and the prescription drug bill he co-sponsored with Sanders. Gillibrand was the only senator running for president, other than Sanders, to show up at his re-launch of the bill. She focused on the 4-year transition period and the public option during that time, a section she said she wrote. Under that plan, premiums would be capped at between 2 and 5 percent of income, depending on how much a person earned. "I dare any insurance company to just try to compete," Gillibrand said. "If you provide that transition period, I guarantee you, you will get to Medicare for All as a single payer, because the people are going to choose it." Klobuchar’s staff said she would consider Medicare for All, but her immediate approach favors expanding buy-in options, whether that’s through Medicaid or Medicare. Klobuchar positioned herself in a similar way on prescription drugs. Senate Democrats have two bills aimed at cutting drug prices One, with Sanders as the lead sponsor, essentially would cut prices in the United States to match those in Canada, Europe and Japan. The other, from Klobuchar, would allow the Medicare program to negotiate directly with drug makers to reduce costs. All of the Senate presidential hopefuls, except Sanders, signed on to Klobuchar’s bill. And all of them, except Klobuchar, signed on to the pricing bill. Some of the Democratic candidates for president have spoken more forcefully than others in favor of Medicare for All. Former San Antonio mayor Julian Castro and Hawaii Rep. Tulsi Gabbard have said the country needs this approach.